The BL12B2 beamline is part of the Taiwan X-ray facilities at SPring-8. It is designed to provide atomic-resolution structural probing environment for biostructure and materials researches. Combining various configurations of the beamline optical components, the users can operate the beamline in either white mode, or monochromatic mode with X-ray energies from 5 to 70 keV and an energy resolution ΔE/E ∼ 10-4. Four experimental stations are attached to the beamline, including X-ray Absorption Spectroscopy (XAS), powder X-ray diffraction (PXD), X-ray scattering (XRS) and protein crystallography (PX). 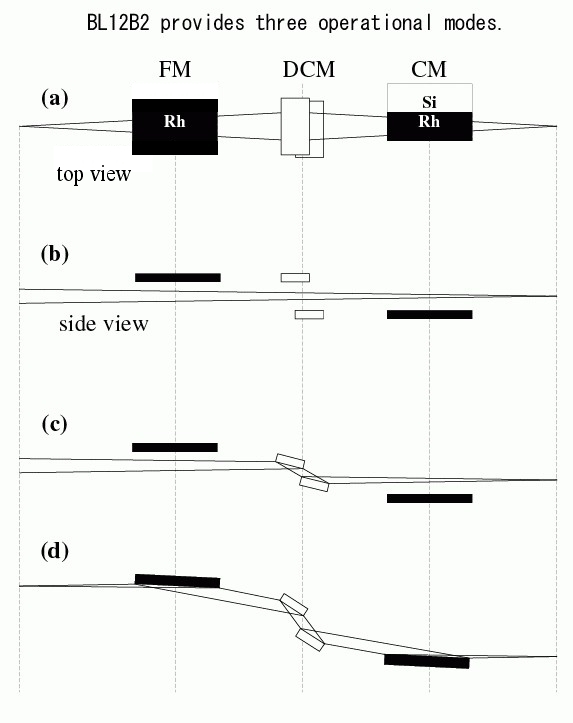 The beamline optical design follows mostly the generic SPring-8 BM beamlines design (Fig.1). The beamline optics consists of three major components: (1) a dual-strip (Rh + Si) collimating mirror (CM) for beam collimation, higher harmonic suppression and thermal load reduction, (2) the standard SPring-8 adjustable-inclined double crystal monochromator (DCM) for photon energy selection in the energy range 5 keV to 70 keV, (3) a toroidal Rh-coated to focus focusing mirror (FM) focusing beam at PX sample position. The beam spot is measurement 250 µm × 250 µm, at PX sample position, with 2 × 1011 photons/sec/Si (111) at 12.4 keV. * Sorry, Some parts of results are displayed using Japanese characters.